theatre style, we can cater for groups of 110, Banquet style we can cater for groups of 60. Ideal for meetings, conferences, weddings, and receptions. Staff are happy to arrange daily activities for partners of convention delegates. Kangaroo Island Tours, sightseeing, shopping, sports; there are many things to see and do on Kangaroo Island and the principle town, Kingscote. Equipment available at the convention centre includes overhead projector and screen, video projector, white boards, flip charts, television, VCR and stand, cables, access to computer, photocopier and fax. Whilst at Acacia, enjoy 4½ star luxury accommodation on Kangaroo Island at Kingscote, the principle town on Kangaroo Island. Take a break from the meeting schedule and relax in style as you tour in 4WD comfort. 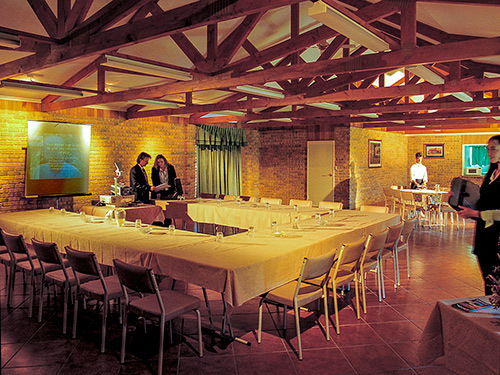 The Kangaroo Island convention Center at Acacia has everything to make your management meeting, seminar, or convention successful. 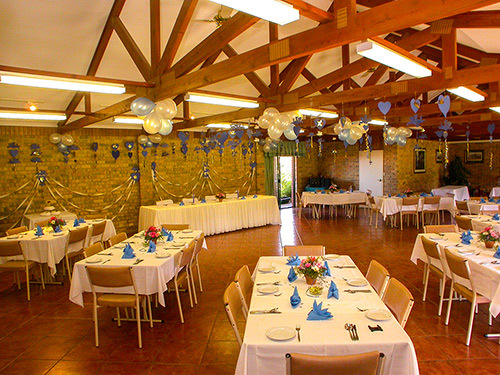 We can cater for groups of 60 in a typical banquet style seating and table arrangement.